Clark Stationery - Embossed Graphics - Flourish Cards. For all Calling Card choices click Embossed Graphics to go to our sister site to order. Item Name: Flourish Cards. 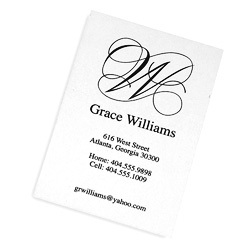 For all Calling Card choices click Embossed Graphics to go to our sister site to order. Description: Create your personal calling card. The Flourish card offers your initial, name and up to six additional lines of personal information. Papers: White or white Ink Colors: Navy, Black, Red, Emerald, Slate, Fuchsia, Purple, Mocha, Ocean and Sage. Size: 2.375" x 3.5"